Following its acquisition of BitTorrent Inc., the TRON foundation says it is considering changes to BitTorrent that have the potential to improve the ecosystem. TRON founder Justin Sun says that his company is mulling the introduction of financial rewards for those who seed, something which he hopes will lead to faster download speeds and greater content retention. 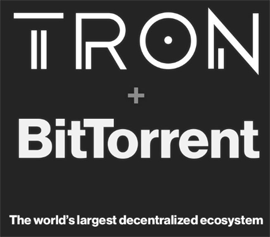 Late May, TorrentFreak learned that Justin Sun, the entrepreneur behind the popular cryptocurrency TRON, was about to acquire BitTorrent Inc, the company behind the uTorrent and BitTorrent Mainline torrent clients. BitTorrent Inc. acknowledged that negotiations were underway but few official details became available until last week when both BitTorrent Inc. and the TRON Foundation confirmed the acquisition had taken place. “We are excited to announce that TRON has officially closed its acquisition of BitTorrent,” BitTorrent Inc. announced. The joining of the TRON network and in excess of 100 million BitTorrent users is an intriguing proposition but precisely how the pair will mesh and provide value to each other is yet to be revealed. Following a new announcement from Sun, however, we have an early sign that the bandwidth of at least some BitTorrent users could eventually become monetized. Under the current arrangement, BitTorrent users in public torrent swarms are left to make their own decisions about what content they obtain, where from, and for how long they choose to share that content (seed) once they have it on their own machines. It’s a personal choice that has few motivations beyond basic altruism. This system has worked exceptionally well for more than 15 years but it now appears that Sun has plans to introduce financial incentives into the equation, a move that he believes will improve the quality of the BitTorrent sharing experience. “Currently, we are exploring the possibility of using the TRON protocol to improve the BitTorrent protocol, in order to make BitTorrent protocol faster and lengthen the lifespan of BitTorrent swarms. I hope the integration of TRON and BitTorrent will allow both parties to work better as one in the future,” Sun says. The common sense conclusion is that Sun envisions a system in which BitTorrent users can earn TRON (TRX) by sharing content with other BitTorrent users. This appears to be based on the theory that people will share more and for longer when they’re being rewarded financially for doing so. If people are able to be incentivized in this manner, the knock-on effect should be a greater number of seeders overall and a corresponding increase in upload bandwidth availability. In theory, at least, this should not only translate to faster downloads but also greater content retention. “The TRON network will serve as the underlying protocol of the Secret Project. Hundreds of millions of BT users across the globe will become a part of the TRON ecosystem,” Sun notes. While it’s clear that Sun envisions BitTorrent users having the ability to get paid for seeding, it’s unclear who will be picking up that bill. The most obvious conclusion is that the people who utilize that extra bandwidth (downloaders) will have to pay to access it, but that part of the puzzle is currently up in the air. The other interesting possibility is that given BitTorrent users’ ability to get paid for seeding (and presumably downloaders being charged for downloading) there is the opportunity for a legitimate content market operating with a twist on traditional buy/sell lines. Sun hints at that within his announcement. “The integration of BitTorrent and TRON will offer new possibilities to global payment and settlement of online content. The creators of this content could reach hundreds of millions of global users through this decentralized network without any intermediaries,” he writes. There can be little doubt that the monetization of the BitTorrent ecosystem has the potential to startle those who have become accustomed to an entirely altruistic system. However, Sun is offering a number of assurances, including that his “Secret Project” will not associate itself with any mining projects, meaning that torrent clients themselves won’t become slaves to the system. “Various industries will be significantly affected by these changes. Secret Project will not associate itself with any mining projects, nor will it have any negative impact on BT user experience,” Sun adds. While it’s early days, these words should be of some comfort to those who fear that the entire system could eventually become monetized to the detriment of free users who’ve supported the system for many years. That would be a nightmare scenario for millions of users and would almost guarantee an exodus. However, acting as a behavior regulator is the ability of BitTorrent users to adopt whichever torrent client they like if uTorrent or BitTorrent Mainline prove too restrictive or unpalatable. Given that keeping user numbers up is probably one of the main priorities, people shouldn’t expect anything too drastic in the short term. Finally, it’s worth pointing out that the idea of paid seeding isn’t new. Back in 2015, we reported on JoyStream, a torrent client that aimed to improve BitTorrent by facilitating Bitcoin payments in exchange for upload bandwidth – or content, whichever way one prefers to look at it.